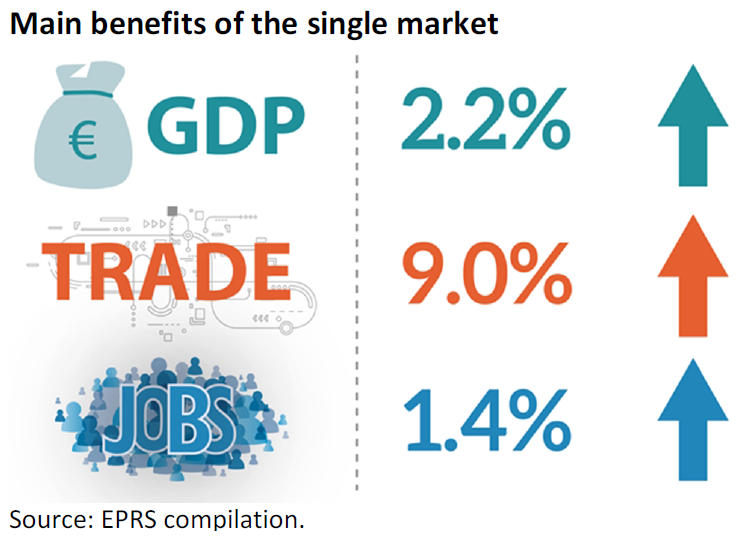 The single market constitutes the largest barrier-free, common economic space in the industrialised world, encompassing over half a billion citizens in an economy with a gross domestic product (GDP) of some €13 trillion. Since its creation the single market has added 2.2 % to the EU gross domestic product (GDP), increased employment by 2.8 million, and promoted inward investment into the EU economy. Delivering and completing the existing single market could potentially allow for a €651 billion additional benefit per year. The EU single market (also known as the internal market and, originally, the common market) prescribes free movement from one EU Member State to another of goods, people, services and capital (known as the ‘four freedoms’). This is implemented by eliminating barriers so that citizens and companies in the EU can benefit from direct access to 28 countries and over 500 million people. Intra-EU tariffs and trade quotas were progressively abolished from the 1960s onwards with the creation of the customs union. While intra-EU tariff barriers were completely eliminated by 1968, non-tariff barriers remained – such as divergences in technical regulations, administrative obligations, currency devaluations, and tax differentials. In 1986, the Single European Act set a deadline to complete the EU single market by the end of 1992. It helped to revitalise the EU economy, as companies were enabled to operate across national boundaries − realising both their ‘comparative advantage’ and economies of scale − and consumers enjoyed widening and cheaper choice in increasingly competitive markets. This process was given additional impetus by the parallel broadening of the market, with its enlargement: from a Community initially encompassing 170 million people in six Member States in the late 1950s, the number of EU citizens grew from 345 million in 12 Member States in 1992, to just over 500 million in 28 Member States by 2013. Since the creation of the European Economic Area (EEA) in 1994, the single market has also included Iceland, Norway and Liechtenstein. The number of companies located within the single market has risen from 12 million in 1999 to 22 million in 2014, adding up to an increase of 10 million companies in 15 years. The European Parliament believes that free movement of goods, capital, services and people still offers untapped potential for citizens and business, in terms of efficiency, growth and job creation. Regarding the free movement of goods alone, the untapped potential would represent as much as €183 billion per year – 1.3 % of EU GDP. And the long-term potential gains from completing the single market in services would be of the order of €338 billion, or 2.4 % of EU GDP. Finally, the detriment to the consumer resulting from an incomplete single market in the consumer acquis – the body of EU consumer law – would be around €58 billion per year, or 0.42 % of EU GDP. European Parliament has repeatedly called on the Commission to submit proposals to bring the single market to its full potential. See, for example, European Parliament resolution of 15 February 2017 on single market governance, European Parliament resolution of 26 May 2016 on non-tariff barriers in the single market, European Parliament resolution of 12 April 2016 on towards improved single market regulation, European Parliament resolution of 7 February 2013 on better governance for the single market, European Parliament resolution 20 May 2010 on delivering a single market to consumers and citizens. The single market enabled European consumers to enjoy a greater variety of products. From 1992 to 2006, the single market increased EU GDP by 2.2 %, representing €233 billion, or around €500 per citizen. From 1992 to 2006, the single market created 2.75 million jobs, representing a 1.4% increase in total employment. The single market increased intra-EU trade by 9 %. In the absence of the single market, per capita European incomes would be 12 % lower today. The reduction of trade costs resulted in additional trade flows – between 1992 and 2012, intra-EU trade intensity rose from about 12 % to 22 % of GDP – and higher benefits from existing trade flows. The single market has also increased the attractiveness of the EU as a trading partner for third countries and the ability of EU firms to compete on global markets. Between 1992 and 2016, exports of goods and services as a share of EU GDP rose from 5 to 43 %. The single market has increased competition in the manufacturing sector, which has led to convergence of prices and spurred innovation. Trade in goods is 60 % higher than if trading partners relied on World Trade Organization rules. From 1994 to 2015, intra-EU trade in goods more than quadrupled, from €800 billion to €3 063 billion per year, in part due to successive enlargements of the EU. The single market boosted bilateral exports and imports of goods by Member States by about 8 %, resulting in a 2%-3 % higher per capita income throughout the Member States. Since 1992, intra-EU exports have risen from 9 to 21 % of EU GDP. The number of EU citizens living in Member States other than their own has risen from 4.6 million in 1995 to 16.0 million in 2015. 22 of the 28 EU Member States (plus Iceland, Norway, Switzerland and Liechtenstein) participate in the Schengen Agreement, which allows passport-free travel for over 400 million citizens, who make over 4 million trips as tourists in another EU Member State every year. Around 3.7 % of the total EU workforce – 3 million people – now work in a Member State other than their own. Increasing workforce mobility is estimated to add about 0.3 % to the EU GDP each year. The number of students studying in an EU Member State other than their own has increased from 3 000 in 1988 to 272 000 in 2014. Since 1987, over 3.3 million students and 470 000 teaching staff have taken part in the EU’s Erasmus programme. Between 1999 and 2005, the single market increased intra-EU trade in services by 5 %. Trade in services is 9 % higher between EU Member States than would have been the case in a free trade area (without tariffs, but with other barriers remaining). There has been an increase in trade in services across Europe since 1992 – between 1992 and 2013, intra-EU trade in services rose from €215 billion to €685 billion – although it is unclear whether or not the single market is the only driver. It is estimated that the Services Directive has already increased EU GDP by 8 %, with an impact varying between Member States from 0.3 % to over 1.5 % of GDP. The breaking down of barriers in the EU telecommunications market has improved efficiency in the economy. Consumers saved €9.6 billion between 2009 and 2013, thanks to lower roaming charges. Capital flows in the euro area averaged €6.73 billion from 1999 until 2017, reaching an all-time high of €95.70 billion in June 2017 and a record low of -€71.22 billion in October 2008. The annual flow of inward foreign direct investment (FDI) into the EU rose from €64 billion in 1992 to €280 billion in 2016, peaking at €730 billion in 2007, before the 2008 economic crisis. The Single European Act set a deadline for completing the internal market by 31 December 1992. Although a lot was achieved between 1986 and 1992, the single market was never completed as such. Some of the 3 500 single-market measures so far adopted, mainly to establish common or minimum standards, still need to be implemented or effectively enforced. Although the Commission says that the formal rate of non- or incorrect transposition in Member States has fallen to only around 1 %, the Monti Report of 2010 suggested that half of the single market directives faced implementation difficulties of some kind. At any given time, around 800 infringement complaints are pending. In 2014, it was estimated that there were also still significant ‘missing links’ in the single market. Action on four fronts – full implementation of the Services Directive, further integration of the energy and financial services sectors, and further progress in opening up public procurement – could add an additional 3 % to EU GDP by 2020. The economic cost of market fragmentation and of the gaps and deficits is huge. Completing the single market would trigger economic gains ranging from €651 billion to €1.1 trillion per year, equivalent to a range of 5 % – 8.63 % of EU GDP. It would also create at least 7.5 million jobs by 2030, in the digital single market (223 000 jobs by 2020) and research (7.2 million jobs by 2030) areas alone. The magnitude of the estimates vary across studies, depending on the methodology used and the assumptions about the extent to which internal market barriers are further reduced. However, they all show that such a further deepening of the single market would have substantial benefits for EU citizens and business in terms of higher incomes and employment and greater choice and business opportunities. Noticeably, the estimated effects of reducing trade barriers are not uniform across Member States. It is worth noting that in existing studies, a large part of the direct and indirect impacts of single market integration are of an economic nature. Nevertheless, the EU single market also serves other purposes, such as supporting inclusive and sustainable growth and protecting European consumer rights. Further research should show that potential gains could be evidenced by a holistic analysis, namely by taking into consideration all macroeconomic, social and environmental aspects of further dynamic effects on welfare, employment, income, and the environmental footprint.